How many of you go traveling with your dogs? As many of you know, we love going on adventures with our dogs. One of the things we have always made a big deal about though is safety with our girls. Just like they are for us, car accidents can be extremely dangerous. Once we saw the Center of Pet Safety’s first studies after we got our first girl Reya, it wasn’t even a question that we needed harnesses for the girls. What is even scarier is how many harnesses out there don’t pass car safety tests (some of them even shred apart!). Since the last thing in the world I could imagine is losing Rylie or Ivi in a car crash, we went with one of the only options on the market that passed safety testing for large dogs : Sleepypod! While we already had a Sleepypod Utility for Ivi, Rylie had recently outgrown Ivi’s old puppy harness, leaving us looking for a new one for our growing puppy. Luckily, Sleepypod had the perfect solution for when she is traveling in Mom’s SUV or Dad’s car – the Sleepypod Sport. After asking them a bit about this new harness, we were excited when they asked Rylie to check to try out a harness and share the results with our readers! Sleepypod Sport Harness: What is It? Looking for an awesome harness to keep your pet safe in the car? If so, we think you will love the Sleepypod Sport Harness. Using their patented Infinity Loop design and their special padded vest to absorb energy, the harness is designed to distribute and reduce force in an accident that could severely harm your pet or you. Not only does it keep dogs safe, it allows them more comfort than the Sleepyod Utility, giving dogs the ability to lie down or sit comfortably to make their car ride as comfortable as possible. Make sure to watch the video below to see how this harness works during an accident (from the Center of Pet Safety’s testing). 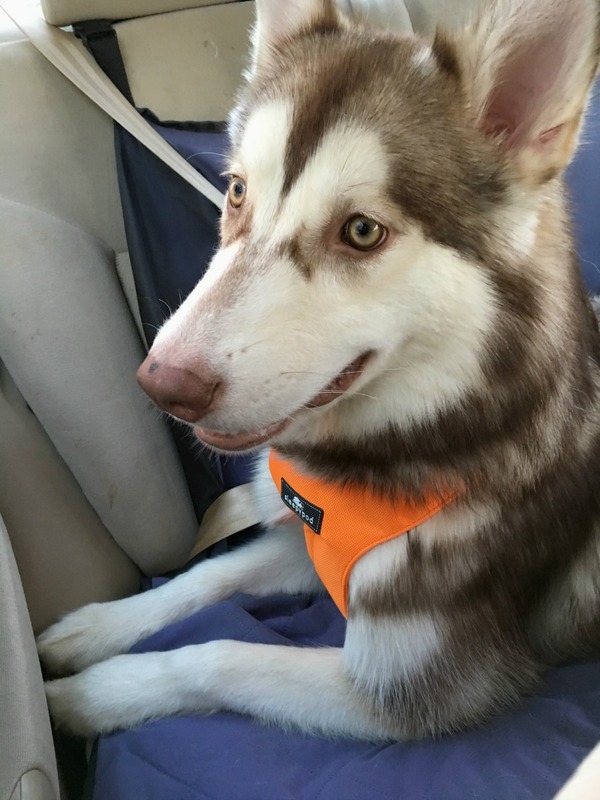 As someone who has used Sleepypod with all of her malamutes, I have to say I do like this harness. Not only is it very easy to use (not worrying about anchors) but it is great for walking too. I will freely admit, while I love the Sleepypod Utility for the back of the SUV, it is a bit of a hassle getting on in the backseat of a car and doesn’t work well as a walking harness (we usually have to put Ivi’s Easy Walk Harness on under it). With this harness, all you have to do is slip the seatbelt in the loops, buckle up, and you are ready to go. The only catch is that you MUST use a shoulder strap style seatbelt or it does not work properly. Overall, Rylie seems pretty happy in this harness. While it doesn’t work for the back of the SUV, it does work anytime she is riding in a back seat. If you are looking for an awesome harness for travel that works for up to 90lb dogs, we think you will love the SleepyPod Sport. Based on our own experience, we are delighted to give the Sleepypod Sport an A+ rating! Want to purchase this awesome harness for your own dog(s)? You can find the Sleepypod Sport Harness on the Sleepypod website! Want to learn more? Follow Sleepypod on social media! I love this harness! I Not only does it keep my dog safe (who otherwise would roam the car; I’m always afraid he’d going to get hurt if I have to stop suddenly or get in an accident), but it allows him to stand up or sit down comfortably, which he’ll love! I also like how easy it is to use, having relying on anchors. This is such a great giveaway. I have been harnessing my dog in the car for several years now. He thinks it’s part of his routine. Great ideal/product. This would prevent my fur baby from rambling around the car and also keep them super safe. It still lets them be some what moveable and thats another great point about the Harness! My grandson has a German shepherd puppy (rapidly growing, of course) and could really use this. He takes the dog to the dog park, so he’s frequently taking it in the car. This looks like a really good harness for him. The Sleepypod Clickit Sport Harness is awesome! We all know how much our “furry” children like to climb all over the car and stick their head out the windows, well just like our not so “furry” children we dont let them do that so this harness is a lifesaver. Literally! Theres been numerous times were Ive just made a normal stop and theres a flying “furry” child. lol No, never has been hurt, but it could happen. Everyone in our car wears a seatbelt, that goes for our dog as well. He is part of our family! Thank you Sleepypod! Everytime my dog gets in the car with me, I think I should have a way to buckle him in. He loves car rides but I worry about not only him getting hurt in an accident but anyone else if he gets thrown around! I’m looking into Sleepypod as a solution! I would like to have one of these harnesses for our Shih Tzu Sparkie. He doesn’t go with us anywhere now unless we need to take him to the vet, but we are hoping that everything will go right over the next few months and we will be able to move and then Sparkie will be along with us for about a 2500 mile move. I have three rescued Treeing Walker Coonhounds. This would not only be great for walking them (they tend to pull and I don’t want them to choke themselves), but wold be great in the car. I won’t let my dogs run loose in my vehicle. I also drive rescue transports. Every dog is either crated or tethered. Too many dogs get loose during accidents by not being tethered. However, that isn’t enough to keep them from getting hurt if there IS an accident. I worry about my babies and would love to help keep them safe with a great harness like this. It’s a great looking product! I have to laugh because just last week I was saying to my fiancé that we should look into getting something like this. At least now I know what I want in a harness! We have a similar product for our Pit and it works great.She is a hard puller and with this she s much easier to walk.T also is much easier on her neck. We would love to have another for back up. Thanks for the contest. I had never really thought about harnesses for my Ozzy but recently I read where someone was in an accident and their dog got scared and ran.. Thanks for the review. I need 2 of these for my dogs. They normally ride in the back of my SUV, but I always wonder about their safety without seatbelts. This is what all pet owners need to keep their pets safe! I know I do! I always worry about my dog. I think the great thing about this harness is that my dog Monty would tolerate it without getting stressed. He doesn’t like things that are too restrictive. Love that this makes travelling with the pups so much safer! I transport dogs to the vet for people who cannot drive, and this would make the trip so much safer, and much calmer!!! What a great product! I love that it can also be used with a leach for walking our dogs! fIt is so important to make sure your pet is buckled in. This would be great to have. Every dog should have one of these harnesses! I am going to get one for my pugs. This makes perfect sense. I belt my children in when in the car and I love my Sadie just like my kids. I’m impressed! Earlier this year, we adopted an older dog who is not good in the car. We have a regular harness for him and got one of those clips that hook his harness to a seat belt, which keeps him in the back seat. 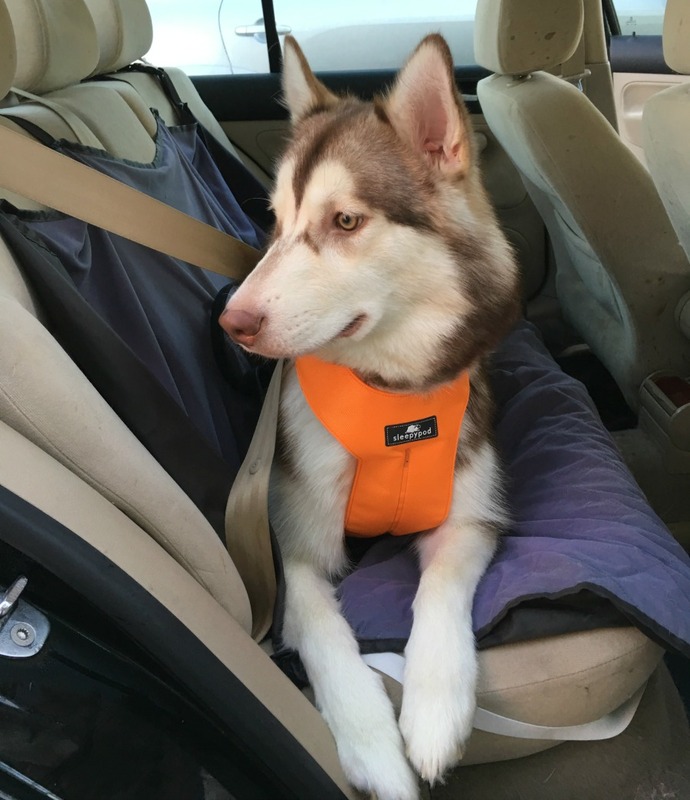 But the Sleepypod Sport Harness looks like it might be the solution to the problem of taking Maverick in the car. Thanks for the review! This is such a great product for keeping pups safe in the car. Even if you’re just taking a drive near home, it’s important to keep them safe just like we keep ourselves safe. My mom had a pit bull/lab mix and he was solid muscle, she got in a car accident (t-boned a lady) and he flew over the back seat into the cargo area. He was fine, but he could have been injured or ejected from the vehicle. This looks like a fantastic idea. Providing both a means of protecting one’s dog, and a means of containment within the car. Good post to remind us ! This is great, we take our dog everywhere with us and yes it’s always a concern about his safety in the car, we are planning a big road trip in a month and this would make me feel safer. I also like that you can use it with a leash and it has reflectors for walking at night. This looks amazing. We lost our corgi back in July and she was always buckled up in the front seat. Well, we getting a puppy in the next three weeks. My daughter totaled her car on Christmas Eve and all airbags deployed. When we were looking at the car (she was not hurt – thankfully) I thought what would happen if you have a dog in the front seat and the airbags deploy. Scary thought. Our new puppy will be in the backseat harnessed in. Thanks for your thorough review on this excellent harness. It sounds like the ideal way to keep your dog safe while riding in the car. Thanks for having this fantastic giveaway! What a wonderful product! It’s so important to keep our furbabies safe. I will keep this in mind! I need to buckle my dog in. Last month, she fell off the backseat and onto the floor when I hit the brake. She tore off her dewclaw and had to go to the vet. As of now, she rides in her crate, where it’s safer. But a harness for her would be wonderful. I love the idea of having an actual harness for the car. I use a regular harness with a special leash that clicks into the seatbelt latch. This is a great product! I really need one for our dog because she slides around all over the place in the car. It makes me nervous. I want to keep her safe. My sister uses something similar to this for her dog. This is a great product. My doggers gets anxious sometimes in the car and is all over the place. You have beautiful furbabies. I have been wanting to get a car harness for my pup and this looks like a great one. Thanks for the info. Love this. My mom and I take her dogs out a lot and she doesn’t use a harness for them. We have been looking for something like this for them and their safety. Thank you for sharing this! I love this! I see so many people letting their pets ride wherever,and that’s so dangerous! This might be something that my grandson should look into. He is an OTR trucker and wants to take his German Shepherd with him in the truck, and definitely would need a harness for the dog. Not just to keep the dog safe, but also to keep him out of my grandson’s lap! Wow – I could use this. I didn’t know these even existed. I like the idea of putting a seat belt on my dog. We are always on the “go” and I want to keep my dog safe. We have used a pet harness with our last two dogs. I think they feel more comfortable travelling with the harnesses on and are less car sick. I like this product. It is so important that our fur babies be safe. I love this harness, I will definitely be checking it out for my dogs. Thank you for sharing. .
A smart idea to keep your pet safe and free from harm while traveling with you. Definitely going to check this harness out, my pups could use one. Thank you for sharing, very pretty pup of yours. I’ve never had a car harness for my dogs. The videos made me change my mind! This is something I need for my dog. She gets in the car and runs back in forth in the back seat. Never just sits down. We recently got one of these and it makes a huge difference. Now my dog, Artie has to stay put and cannot run all over the car.